Remember my post about Smoke in the studio with Thalita? I told you there might be something more with that dress. And here it is. After the smoke shoot we opened the windows and ventilated the studio space. After that we tried another trick with lighting. We combined flash light with continuous light. The flash light is directed at the upper half of Thalita’s body. The flash makes that everything that is lighted by it will be sharp in the image. 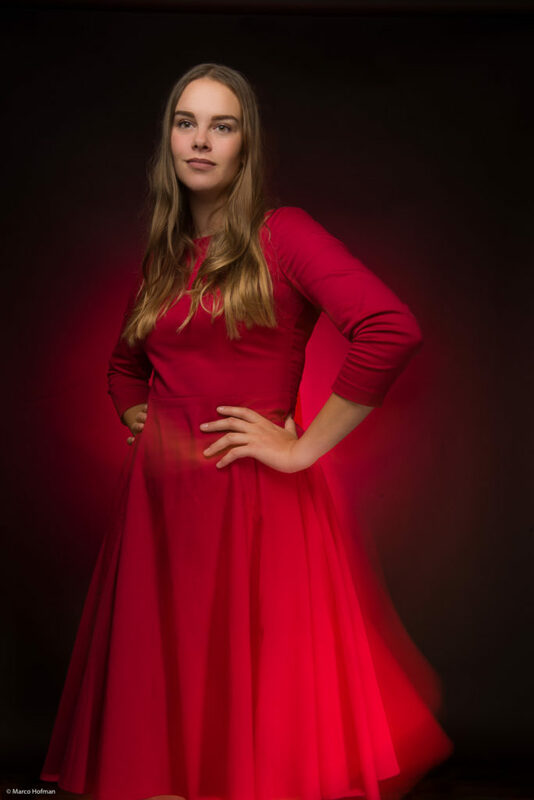 For the bottom half of the dress we used a continuous light. This continuous light combined with a slower shutter speed results in movement. We had several shots to practice the exact motion of Thalita in order to get the movement as we wanted it to be. For this shoot used two studio strobes. One as a key light with a small octabox. A second strobe with standard reflector and grid was used for the background. And at the bottom I used a continuous light with a wide reflector. Of course I had to use a tripod to support my camera and a slow shutter speed in order to catch that movement in the dress. So a big thank you to Thalita for being so patient and cooperative by doing this moves a lot of times in order to get this shot. I like the result.